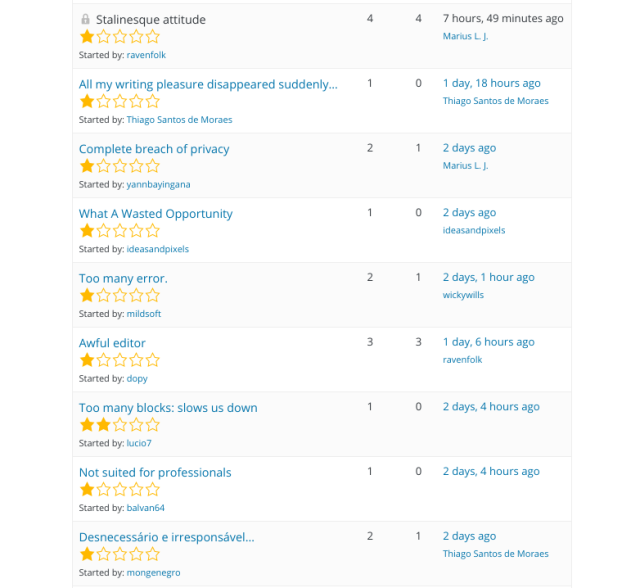 Many critics of Gutenberg have elected to express their disapproval in the plugin reviews. I can say that I’ve never heard a piece of software referred to as “Stalinesque” before! Some of you with experience in the broader software world might be confused as to why this is such a big deal. If you don’t like the WordPress 5 editor, why not just stick with WordPress 4? This is a bad idea, as WordPress does not provide security patches for earlier versions. The only way to fix security vulnerabilities in your WordPress install is to update to the latest version. This itself is not a huge problem, for the most part, as WordPress has a long track record of maintaining backward compatibility. Users have been able to update with confidence that everything will continue to work. On top of that, WordPress doesn’t explicitly follow semantic versioning. There is no reason for users to expect that incrementing the major release number (from 4 to 5) should cause significant compatibility issues for their websites. 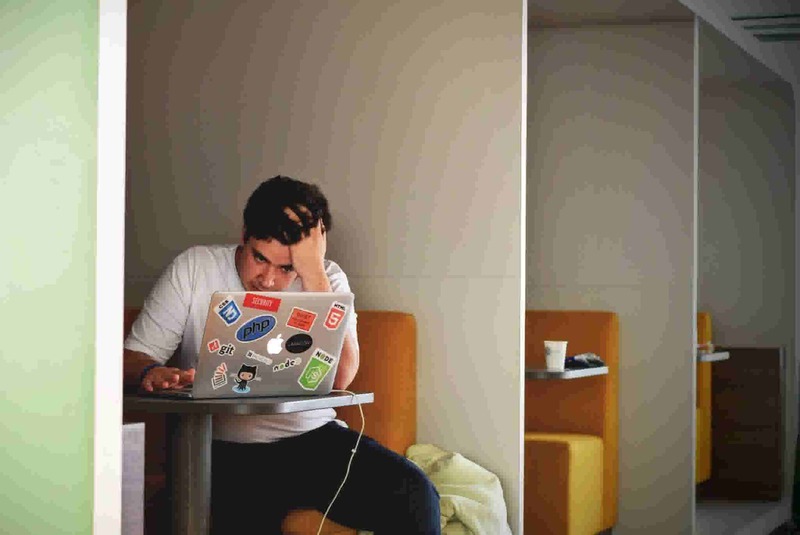 The dogged adherence to backward compatibility might seem great for end users, but it can be a nightmare for developers building on the platform. I’ve spent years developing with WordPress, and had my share of head-meets-desk moments. 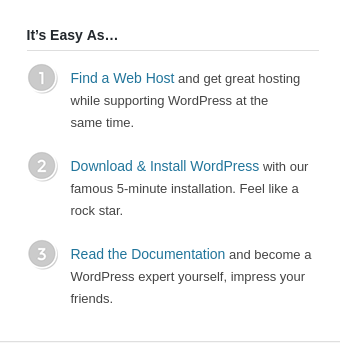 To those learning WordPress: I recommend performing these steps in the exact opposite order. One of the last WordPress projects I worked on involved using the wp_insert_post function. This function enables you to automatically create a new post in the database using the options you provide to the function. One of the options, tax_input, allows you to assign a taxonomy to the post when it’s created. However, this doesn’t always work. If this code is run during a request where the currently logged in user doesn’t have the right permissions, the post will be created without assigning it to the taxonomy. This is the only capability check made by the function — it’s not like it checks if the currently logged in user is allowed to create posts in the first place, so this behavior is wildly inconsistent purely within the context of this single function. So, WordPress: you’ve had a good run. But we think it’s time to move on. If I’ve managed to wear you down by now, you might be wondering: if not WordPress, then what? You’ve walked right into my trap! The future — and, increasingly, the present — of the web is in static HTML. As opposed to a dynamic platform such as WordPress, where HTML is composed on-the-fly by a PHP backend, the HTML for a static site is composed ahead of time such that no processing needs to occur on the webserver beyond serving files when they are requested. Static HTML? What YEAR is it? If the notion of a static HTML website conjures up thoughts of quaint web pages with little construction signs and antiquewhite backgrounds, allow me to bring you up to speed. Static Site Generators — tools such as Jekyll, Hugo, Gatsby, and others — have allowed developers and content creators to create rich and complex static HTML websites. These tools use template and content strategies that still vaguely resemble backend web platforms like WordPress. Content isn’t hard-coded into templates — it’s abstracted away via a templating language (such as Liquid in the case of Jekyll). When the site is built, every piece of content is processed through these templates and converted into a corresponding HTML file. The process is similar to the way a CMS platform would compose an HTML file, with the critical difference being that it occurs a single time, during a build phase, instead of on-demand on the hosting server. Users of static site generators will automate this build phase, having their site build and deploy automatically in response to changes made to the content. It’s sort of like a WordPress site if you were to use an aggressive, full-page caching strategy — and then automatically flushed and re-populated the cache every time you published a change to your content. Why Should I Go Static? On top of that, static sites are incredibly easy to scale. Deploy your static site to Amazon CloudFront and never again worry about your site being “hugged to death” the next time you make it to the front page of Reddit. What About WordPress’ User-Friendly Editor? One of WordPress’ biggest selling points is its editing interface (no doubt why they want to iterate on it with Gutenberg.) Static Site Generators are command-line tools that run against a file system, and don’t offer a GUI for managing content out of the box. This is likely a significant hurdle for many users who would otherwise be interested in adopting the static site paradigm. Fortunately, there are several CMS solutions out there that can solve this problem. Because these CMSes aren’t tightly coupled with your chosen Static Site Generator, you have the option of trying different ones without having to re-code your entire website each time. Forestry’s approach to static site content management updates your content by committing changes to your git repo. This strategy enables you to use Forestry alongside other workflows, and your content is never locked in to our service. Try out our demo site to get a feel for how it works. Being able to adopt a user interface that makes both developers and editors happy has been a tremendous boon to static sites in recent years. With the aforementioned scalability and simpler security landscape, modern static sites are an appealing option for many use cases. To be honest, I find the name Gutenberg a little cloying. Not to say it’s undeserved: it’s named after the inventor of the printing press, and WordPress’ software certainly deserves some credit for enabling the proliferation of ideas across the internet — an estimated 30% of all websites are powered by WordPress! And no name could be more pretentious than the wordpress.org footer, proclaiming in low contrast that “code is poetry”. But my issues here really aren’t with Gutenberg itself, but with the way WordPress has broken from its conventions and created a painful (and mandatory) upgrade path for a huge swath of its users. Gutenberg actually seems like a great idea, and it’s nice to see that WordPress is thinking outside the box in the pursuit of a more intuitive editing experience. Unfortunately for Gutenberg, WordPress has too many problems. With WordPress 5.0 forcing the adoption of a new editing paradigm, leaving countless plugins and themes in the lurch, now seems like a good time to switch to a platform that’s easier to secure, easier to scale, and easier to develop on. It’s time to move on from WordPress.